Fans of KMFDM should be familiar with MDFMK (KMFDM backwards... get it?). If not, than you need to be. The same intensity and industrial-strength power that went into KMFDM is contained within MDFMK. The sonic textures, the aural intoxications, and the stylistic ways they carved a niche in the industrial music scene is ever-present here. Heavy dance grooves echo throughout the songs while the charged, buzz saw guitars roar and the thunderous rhythm section crashes down time and time again, giving the songs the bold, jaunting power that every one contains. 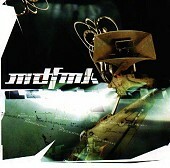 If you're in the mood for good, powerhouse industrial music that isn't afraid to make you dance rather than rattle your head track after track (they do plenty of this, don't worry) than MDFMK just might be your ticket. Listen to it loud and don't be afraid to move to the music. I'll give it an A-.